Distance: about 4 miles (I intelligently drove off with my GPS still running, hence the guesstimate). 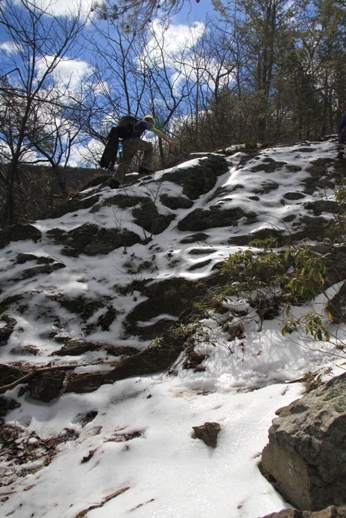 Terrain – Mountain, cliffs, awesomeness (not technically a terrain feature). Ignore where it “ends” according to the red flag, I didn’t turn it off before I took a drive to the Delaware Water Gap Visitor’s Center. The start and stop is where the green arrow is, heading South. 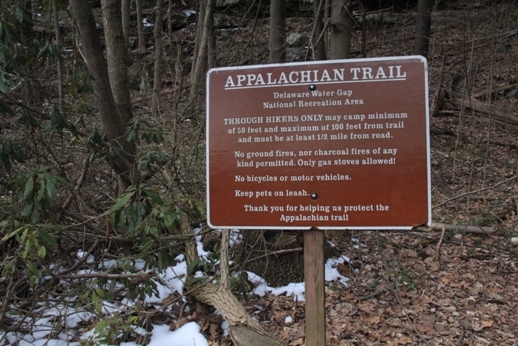 The AT is the line closest to the water, the fireroad is further inland. 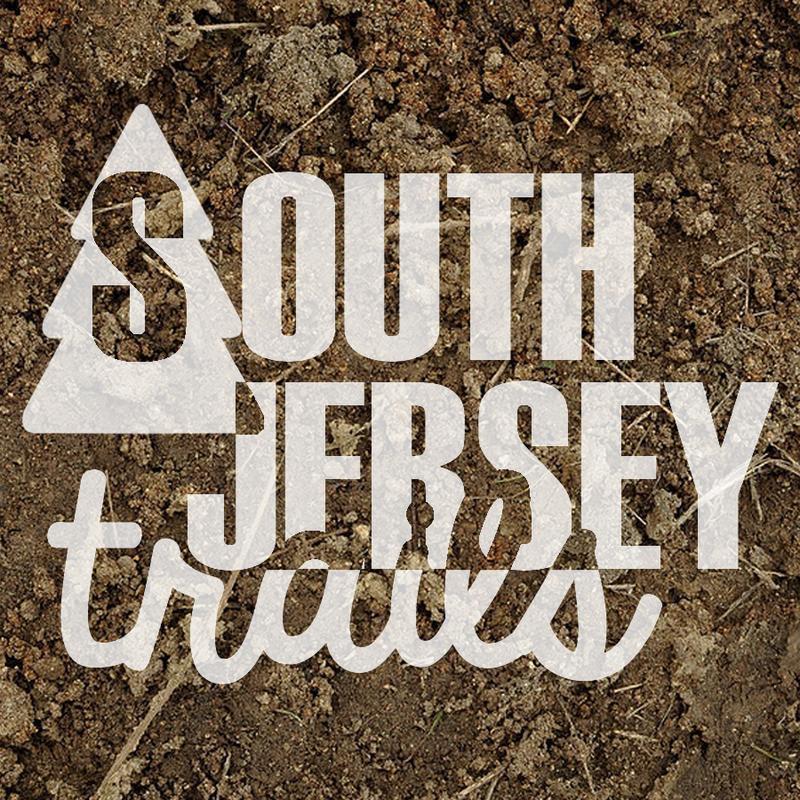 Trailheads – Multiple. 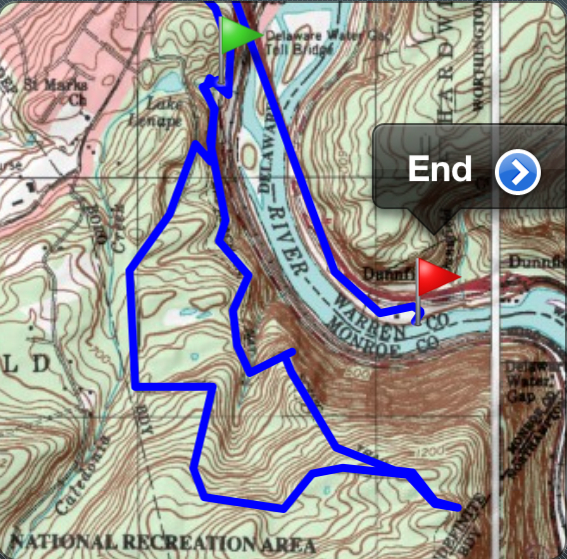 We used the Resort Point Trailhead at the overlook on Route 611– 40° 58.692’N, 75° 8.294’W. 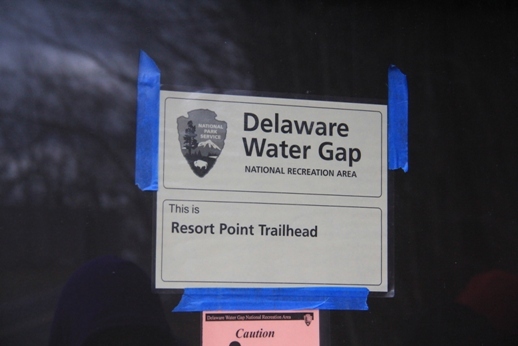 The more popular one starts at nearby Lake Lenape off Mountain Road. Directions: Take I-80 West over the bridge (Toll – $1?) into Pennsylvania. 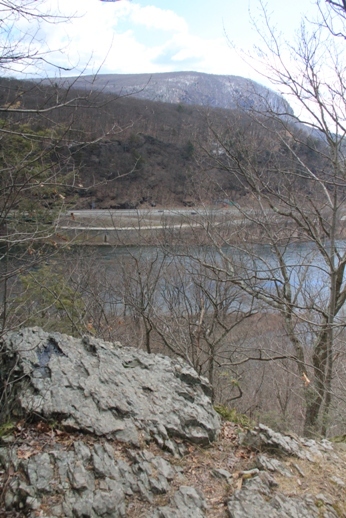 Take Exit 310 toward PA-611/Delaware Water Gap. In 1/2 mile, turn left onto Foxtown Road. Then turn onto PA-611. 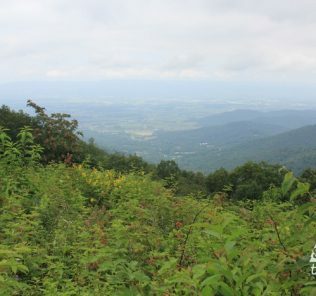 Drive about a mile until the parking lot/overlook is on the left side. 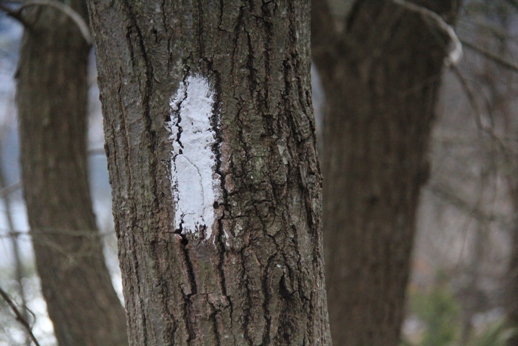 Markings – Blue blazes to the Appalachian Trail, then white blazes all the way up. On the way back, you’ll follow the old road. Description: So, I’m violating the entire premise of this blog with this post. 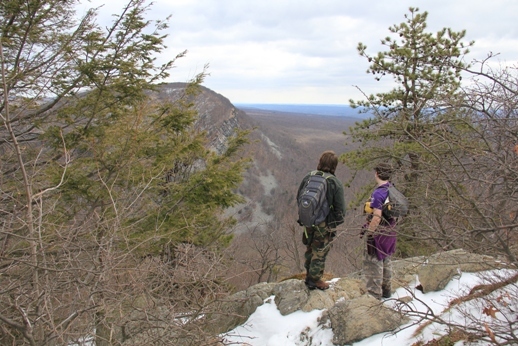 This hike is not only near North Jersey (distiguishable from South Jersey because it’s, you know, north. And has mountains. And people talk funny. And root for the wrong teams), it’s actually just across the river in Pennsylvania. I promise not to make this a habit. Maybe. 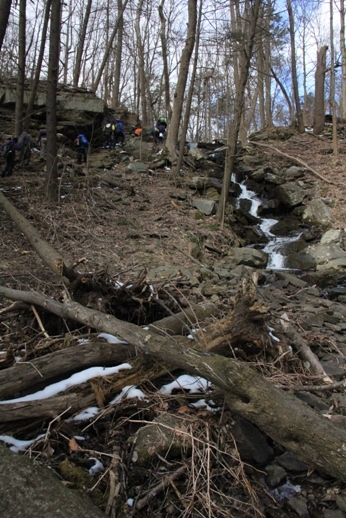 Anyway, so I took this hike on a fine Spring day last March with the Scouts. You can tell its March because there… is… snow… (for the record, this was also our coldest night of camping this year, and we camp every single month. No, it doesn’t make any sense to me either). 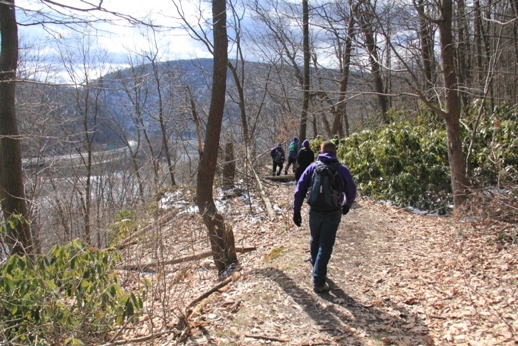 We started out from the overlook on Route 611, but most folks start out from nearby Lake Lenape. I like starting from here because we made a wrong turn and it was easier than backtracking. Also, because you start off with a nice view of the gap right from the start. From this lot, cross the road (CAREFULLY!) 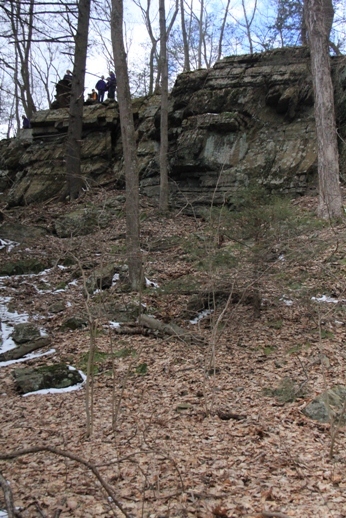 and climb the blue trail next to the waterfall. 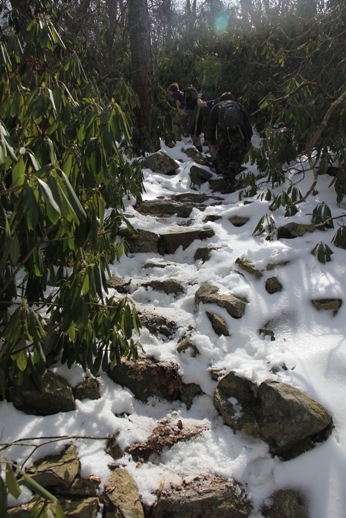 It’s a steep climb, but not very long. 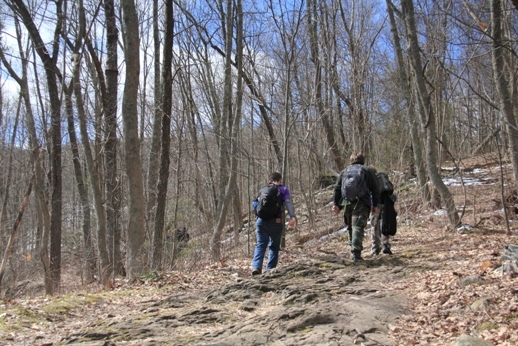 At the top, turn left and continue upwards on the blue trail. 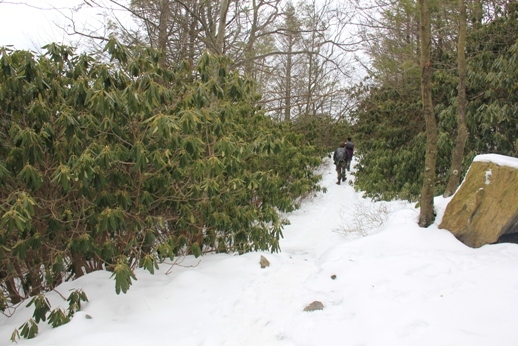 It will very soon connect with the familiar white blazes of the Appalachian Trail. 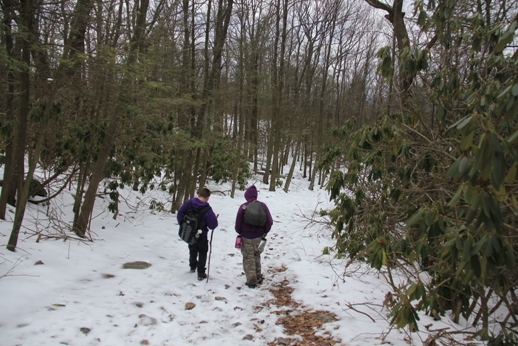 Turn left/straight and head uphill on the AT. As you walk up the AT, you’ll have some great views of the I-80 Bridge. You’ll curve around to the left (mirroring the bend in the river). At some point after this, the AT makes a super-secret turn right up the mountain. You’ll miss it. That’s fine, you end up at quite an overlook. 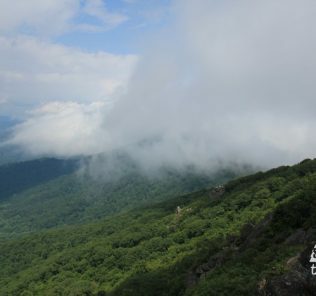 Made it to the AT! Isn’t missing turns fun sometimes? 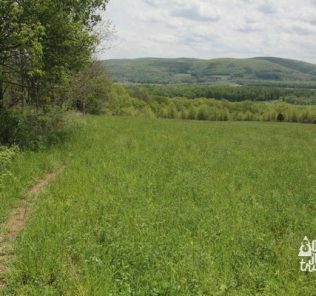 After soaking in the view, you can backtrack to find that pesky turn in the trail and continue ever upwards. Be careful as you cross some roads. 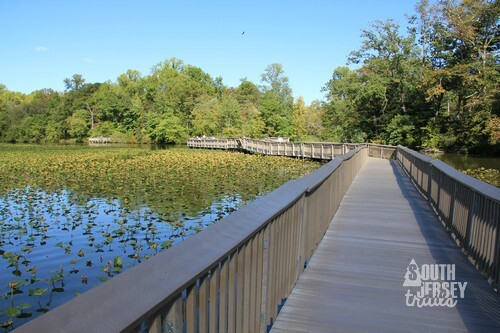 The trail angles slightly to cross, make sure to pick up the trail markers on the other side. 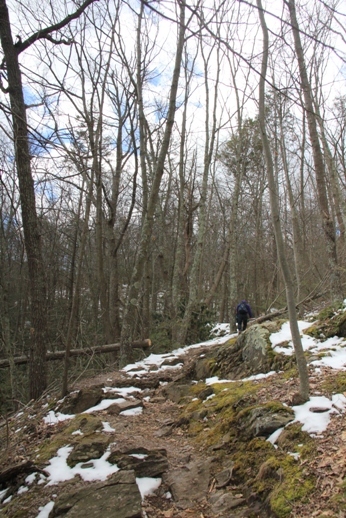 Trail gets very steep again. 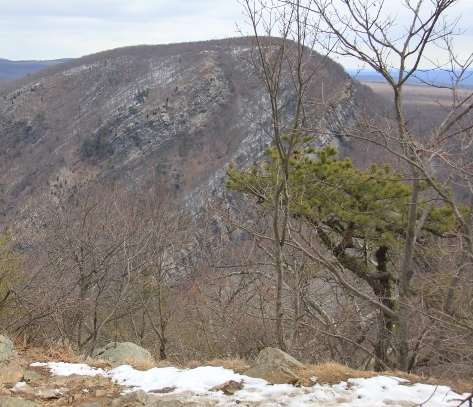 You’ll end up at the top of the mountain with some amazing views directly down into the water gap. This is a great place to have a snack and admire the view. 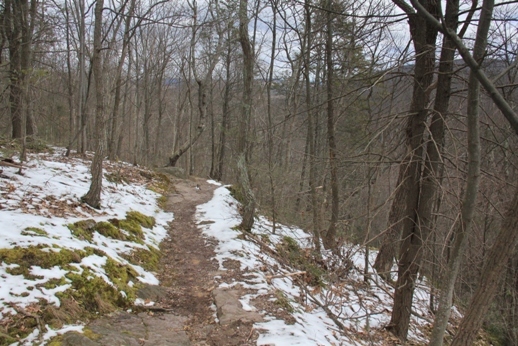 On the way down, you’ll take a slightly longer, but less steep, route down a fireroad. You start by backtracking down the AT. At the road crossing, take the road downhill. Take the road for 2 miles or so until the AT crosses the road. Turn right onto the AT and you will recognize the blue blaze trail you came up on within a few hundred yards (we could see our car from there). Take the blue trail back to where you started. Kids took a side trip. 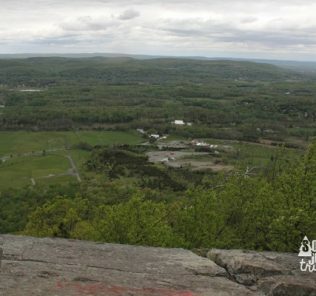 Than its in your car, but there are plenty of great hikes here at the Gap, either up to Sunfish Pond or up Mt Tammany (either on the NJ side). 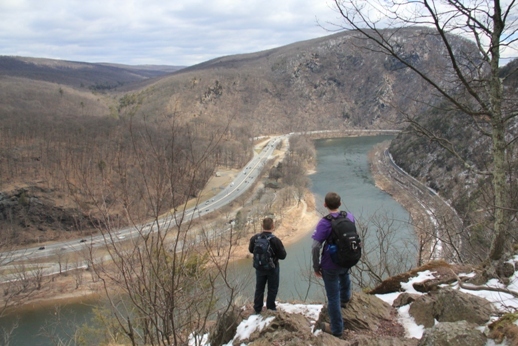 Amazing views of and into the Delaware Water Gap. This was my first time doing this hike, and I thoroughly enjoyed it. 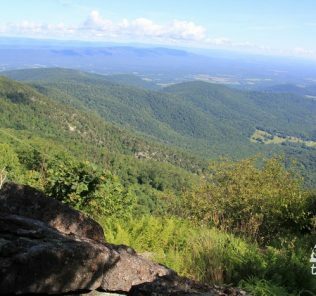 The climb is certainly steep and should not be downplayed, but the hike itself seemed not very hard for such big rewards in the ways of views. 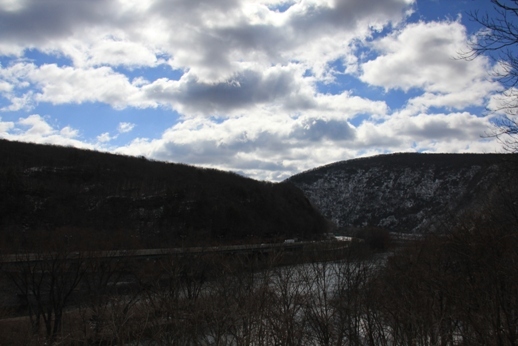 If you are at the Water Gap, do it, you’ll love it. 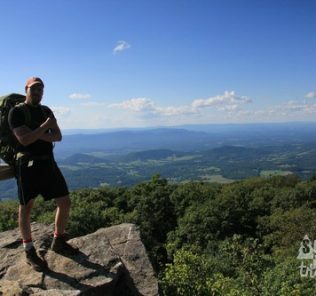 Appalachian Trail, Backpacking, Hiking, national parks, Outdoors.